Leading Manufacturer of Polyester geogrid, Biaxial geogrid, Nonwoven geotextile, Paving fabric and Geomembrane from Chennai. We are a provider of Paving Fabric. Geotextiles is a popular solution for erosion control, slope stabilization, and bioengineering, due to the fabric's substantial mechanical strength. • Roadways, parking lots, loading areas and construction sites. • Prevent drainage systems from clogging with fine particles. 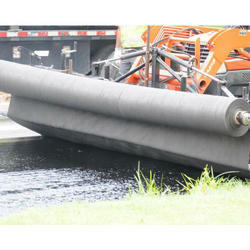 • For waterway erosion control. • Reduce soil piping and embankment erosion. • Prevention of weed growth. • Moisture conservation (in horticulture applications). • Civil engineering applications including roads, airfields, railroads, embankments, retaining structures, reservoirs, canals, dams, bank protection use Geotextiles as raw materials. • Geotextiles can improve soil strength at a lower cost than conventional soil nailing. Looking for Geosynthetic Fabric ?